Gauri Vrat is an important ritual performed by unmarried women and young girls in the month of Ashadha (July – August). In 2012, the dates of Gauri Vrata is from June 30 to July 3. The Vrata is dedicated to Goddess Parvati. (Gauri is another name of Goddess Parvathi). It is mainly observed by unmarried women in Gujarat. Gauri Vrata is observed for five days and begins on the eleventh day in the waxing phase of the moon in the month of Ashada and ends on the Purnima day. A unique ritual of growing corn shoots is observed during the five days. Legend has it that Goddess Parvati had performed this Vrat to get Lord Shiva as her husband. Therefore there is a widespread belief that those who observe Gauri Vrata will get an ideal husband. During Gauri Vrata, unmarried girls observe a partial fast and perform pujas dedicated to Goddess Parvati. During the five days salt is strictly avoided. Food eaten is mainly made of wheat flour, ghee and milk. Different types of fruits are also consumed. 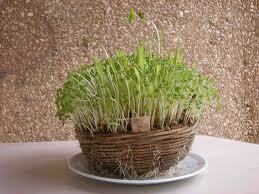 Those observing Gauri Vrata grow corn in a small pot. Sun and the tender corn shoots are worshipped on all day along with Goddess Parvati.